Some months after the death of her parents, Polly is living in England with her two elderly aunts, Dorcas and Constantia. Polly desperately wants to leave the door unlocked on Christmas Eve so that the wise men can enter if they so wish. She also wants to see the three ships arrive, bringing the Virgin Mary and the Child Jesus. The two aunts are nervous about leaving a door unlocked without a man in the house, and they are equally skeptical that any ships will arrive, let alone a ship bearing the baby Jesus and his mother. When Christmas Eve arrives, however, Polly's steadfast faith in the possibilities of the Christmas season is rewarded in ways no one would have expected. The only other Elizabeth Goudge book I have read so far is The Little White Horse, which is beautifully written and a personal favorite. 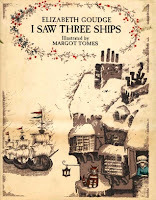 I Saw Three Ships is every bit as well-written and meaningful. Not a single word is out of place in Goudge's descriptions of her setting and characters, and she puts forth an inspiring Christmas story that is heartfelt, but neither cloying nor sentimental. Polly is a character for whom I developed instant affection, and despite their somewhat stodgy exteriors, her aunts are also endearing and amusing, as are some of the other surprising supporting characters. I also love that the lyrics for the Christmas carol, "I Saw Three Ships" are incorporated into the text of the story, just begging to be sung. I like this book very much and would certainly like to read it to my girls during some future Christmas season, after they are past the age of believing in Santa Claus. It's a tale that can really appeal to kids of all ages, but I think the fact that Polly knows her aunts fill her stocking would spoil the magic and mystery of the holiday for them at this stage. But for Christian families, this is really an ideal story for emphasizing and celebrating the true meaning of Christmas. I hope you will read more books by Elizabeth Goudge. If you liked these two, you should definitely try some of her novels for adults. And her children's books are also charming. I read several to my son with great success. Happy reading!